Calling all Yogis and fitness junkies: a very special fundraiser is soon approaching in the next couple of weeks, so prepare your chakras to embark on a healing journey for a great cause!The Power of Movement raises money for the Arthritis Research Foundation, the primary philanthropic funder of the Arthritis & Autoimmunity Research Centre(AARC) at University Health Network (UHN) . 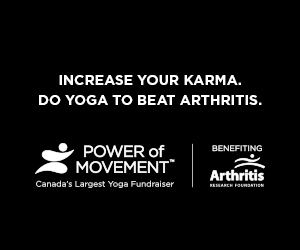 This yoga-based fundraiser is being held to promote awareness of Arthritis and Auto-Immune Conditions and is currently in it’s 6th year in Montreal. The Power of Movement will be taking place on Sunday March 2, 2014 between 9:30am-1pm at the Montreal Forum (located at 2313 Ste-Catherine O – across the street from Alexis Nihon). It all started in 2005 when Dorna Chee, a yoga instructor, placed a call to our Foundation. Dorna had turned to her yoga breathing exercises to help her get through a lengthy stay in the hospital after being diagnosed with lupus. Dorna believed that with more than 4.6 million Canadians living with arthritis, the benefits she experienced, thanks to yoga, could benefit others, and Power of Movement was born. The event will begin with a quick warm up led by Jana Sedivec from Studio Vie and the yoga class will be instructed by Annie Langlois from Mon Yoga Virtuel. We will also have Brian Tuck teaching chair yoga alongside Annie making the class more accessible. The event is shaping up to be more than just a yoga event, but rather a ‘community’ wellness gathering that will engage folks of all ages and at all fitness levels. Organizers will also provide refreshments from Propulsion Cantine Végétalienne, RISE Kombucha, David’s Tea -AND- there will be some amazing raffle prizes available to be won from a variety of Montreal Yoga studios and retail locations. They are hoping for 200 participants in attendance this year, and to raise as much money as possible! So come out and join us on March 2nd to stretch your muscles for a good cause! Power of Movement strives to increase awareness and raise funds for world renowned research that is dedicated to beating arthritis and autoimmune diseases. Photography by: by Paul Eifert.